Special thanks to Mark Aspinall, who forwarded this link to me. This is a very enlightening article about our culture and its indifference to art and beauty. It's a long read, but well worth your time. Joshua Bell plays violin in the subway...and pretty much no one cares. No figures are available breaking the sales down by region, nor is there any data to tell how many iPods were replacements or upgrades. 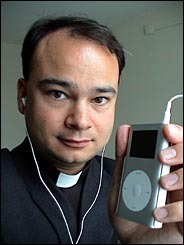 I realize that the raw numbers can't be used to extract any sort of demographic distribution, but, man, almost 32 million iPods! If you use Apple's self-reported 83% market share figure, that means that over 38 million portable audio players were sold worldwide last year, all of which can play mp3s. Mp3s of your church's weekly sermon, for example. Couple that with the fact that your church can make its content available wordlwide, totally free to the listener, and virtually free for the church (as little as $5 a month - for real). This is really a no-brainer for any church. Oh, and by the way, you don't need a portable player to download and listen to a podcast. Any computer with internet access and a sound card will do. If I have piqued your curiosity about this, please feel free to send me an email. (eli@presentsense.org) I would be happy to point you in the direction of podcasting. Video created at first presentsense worship experience.